Mahomes completed 16 of 31 pass attempts for 295 yards and three touchdowns Sunday against the Patriots. He also carried two times for 11 yards in the 37-31 AFC Championship Game overtime loss. Mahomes connected on 27 or 41 passes for 278 yards during Saturday's 31-13 win over the Colts. He added eight yards and a touchdown on three carries. Mahomes completed 14 of 24 pass attempts for 281 yards, two touchdowns and an interception in Sunday's 35-3 win over Oakland. Analysis: It wasn't Mahomes' biggest fantasy performance, but that was largely due to the Raiders' inability to keep the game close. The MVP candidate reached the 5,000-yard and 50-touchdown mark with an 89-yard bomb to Demarcus Robinson in the third quarter, joining Peyton Manning as the only other QB to reach those marks in a single season. The win secured the Chiefs with a first-round bye in the playoffs, so Mahomes will become DFS-eligible in the divisional series. Mahomes completed 23 of his 40 pass attempts for 273 yards and three touchdowns in Sunday's 38-31 loss to the Seahawks. He also added three carries for 33 yards. Mahomes completed 24 of 34 passes for 243 yards with two touchdowns and no interceptions in the Chiefs' 29-28 loss to the Chargers on Thursday. He also rushed twice for three yards and fumbled once, but it was recovered by the offense. Mahomes completed 35 of 53 attempts for 377 yards, with two touchdowns and one interception during Sunday's 27-24 win against the Ravens. Mahomes completed 23 of 38 passes for 295 yards and four touchdowns, adding nine rushes for 52 yards during Sunday's 40-33 win against the Raiders. Mahomes completed 33 of 46 passes for 478 yards, six touchdowns and three interceptions in Monday night's 54-51 loss to the Rams. He also rushed six times for 28 yards and lost two fumbles. Mahomes (foot) appears on the Chiefs' Week 11 injury report, but he practiced fully Thursday, Myles Simmons of the Rams' official site reports. Analysis: There's little doubt that Mahomes will be available for Monday night's game against the Rams, but his presence on his team's injury report is not entirely surprising, on the heels of absorbing five sacks versus the Cardinals in Week 10. Given that the Chiefs and Rams are the NFL's second and third-highest scoring teams to date, there's shootout potential in a compelling Monday Night Football matchup featuring two 9-1 teams. Mahomes completed 21 of 28 passes for 249 yards with two touchdowns and no interceptions in the Chiefs' 26-14 win over the Cardinals on Sunday. He also rushed four times for 21 yards. Mahomes completed 23 of 32 passes for 375 yards, three touchdowns and an interception during Sunday's 37-21 win over Cleveland. He added 18 yards on two carries. Mahomes completed 24 of 34 passes for 303 yards, four touchdowns and an interception during Sunday's 30-23 win over Denver. Mahomes completed 28 of 39 pass attempts for 358 yards, four touchdowns and one interception in Sunday's 45-10 win over Cincinnati. He added 45 rushing yards on four carries. Mahomes completed 22 of 36 pass attempts for 352 yards, four touchdowns and two interceptions in Sunday's 43-40 loss to New England. Mahomes completed 22 of 38 passes for 313 yards and two interceptions during Sunday's 30-14 win over the Jaguars. He added 13 yards and a touchdown on four carries. Mahomes completed 28 of 45 passes for 304 yards and a touchdown in Monday night's 27-23 win over the Broncos. He also rushed three times for seven yards and another score. Mahomes completed 24 of 38 passes for 314 yards with three touchdowns and no interceptions in a 38-27 win over the 49ers on Sunday. He also rushed five times for seven yards and fumbled once but recovered. Mahomes racked up 326 yards and six touchdowns on 23 of 28 passing during Sunday's 42-37 win over the Steelers. He added 18 yards on five carries. Analysis: Mahomes started red hot, finding Chris Conley and Travis Kelce up the seams for two early touchdowns. He showed that he is human by slowing off that otherworldly pace a little bit as the game wore on, but Mahomes still looks like an absolute star to start his career. We're only two games in, but Mahomes' touchdown rate of 18.2 percent is over twice that of Carson Wentz's league-leading rate of 7.5 percent in 2017. Mahomes looks like he can only be contained, not stopped, in Andy Reid's offense. Mahomes completed 15 of 27 pass attempts for 256 yards and four touchdowns in Sunday's 38-28 win over the Chargers. He also had five carries for 21 yards. Mahomes completed 18 of 24 pass attempts for 196 yards and a touchdown during Saturday's preseason contest against the Bears. He also added 11 yards on a pair of carries. Mahomes completed eight of 12 passes for 138 yards with one touchdown and one interception in Friday's preseason game against the Falcons. Coach Andy Reid relayed Tuesday that Mahomes will play the first half of Friday's exhibition game against the Falcons, BJ Kissel of the Chiefs' official site reports. Mahomes completed five of seven passes for 33 yards with no touchdowns or interceptions in the Chiefs' 17-10 preseason loss to the Texans on Thursday. Mahomes is expected to play the first quarter of Thursday's preseason opener against the Texans, Brooke Pryor of The Kansas City Star reports. Analysis: Chiefs coach Andy Reid wants to split the workload evenly between his four quarterbacks, ensuring Mahomes gets plenty of reps heading into his first season atop the depth chart. The 2017 first-round pick struggled with interceptions during the first week of training camp, but he now seems to be finding his comfort zone, completing 24 of 25 pass attempts (with one drop) during Tuesday's practice. 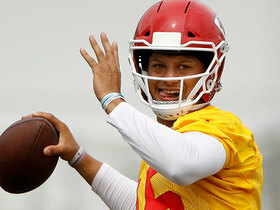 Mahomes has tossed seven interceptions in the Chiefs' first six training camp practices, Adam Teicher of ESPN.com reports. Mahomes worked with some of the Chiefs' skill-position players during the offseason, BJ Kissel of the Chiefs' official site reports. 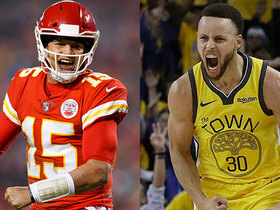 Mahomes will become the Chiefs' new starting quarterback with Alex Smith being traded to the Redskins, Terez Paylor of The Kansas City Star reports. 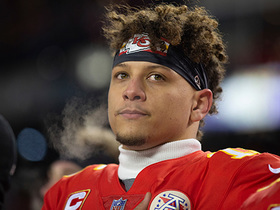 Analysis: It's clear Mahomes has been the Chiefs' quarterback of the future since the team moved up 17 spots to draft him in the first round last April, but it's now apparent that the future is here. The 22-year-old has one start under his belt, a 27-24 win over the Broncos in Week 17 in which he completed 22 of 35 passes for 284 yards and one interception. 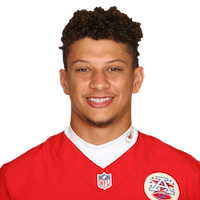 Known for a rocket arm and athleticism, Mahomes will now get the entire offseason to get accustomed to his new role in the Chiefs' offense. Mahomes completed 22 of 35 passes for 284 yards and one interception during Sunday's 27-24 victory at Denver. He also rushed seven times for 10 yards. Mahomes will start at quarterback in Sunday's regular-season finale against the Broncos, Terez A. Paylor of The Kansas City Star reports. Mahomes will remain in a backup role during Sunday's game against the Jets after head coach Andy Reid reiterated that Alex Smith was the Chiefs' starting quarterback, Terez A. Paylor of The Kansas City Star reports. NBC Sports sportscaster Al Michaels gives high praise for Kansas City Chiefs quarterback Patrick Mahomes. The "Good Morning Football" crew discuss if Kansas City Chiefs quarterback Patrick Mahomes will be enough to win a Super Bowl if Kansas City Chiefs don't address their defense. 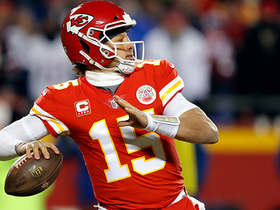 NFL Network's James Palmer highlights the biggest thing Kansas City Chiefs quarterback Patrick Mahomes improved on throughout the 2018 season. NFL Network's Tom Pelissero brings the latest from Chiefs training camp on QB Patrick Mahomes and his development so far. 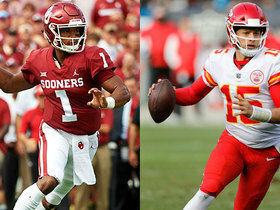 NFL Network's "Soul & Science" compares Oklahoma University quarterback Kyler Murray to Kansas City Chiefs quarterback Patrick Mahomes. 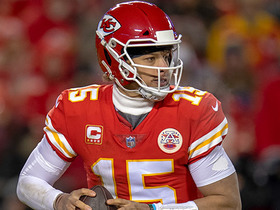 NFL Network's MJ Acosta discusses which QB drops the prettiest dimes and why Kansas City Chiefs quarterback Patrick Mahomes is set to succeed in 2019. 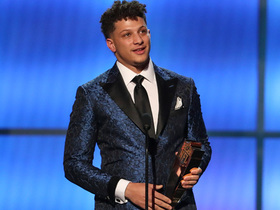 Kansas City Chiefs quarterback Patrick Mahomes accepts the AP NFL Most Valuable Player award after a stellar 2018 season. Actor and Kansas City Chiefs fan, Paul Rudd, reveals a custom jacket to announce Chiefs quarterback Patrick Mahomes as the 2018 winner of MVP. 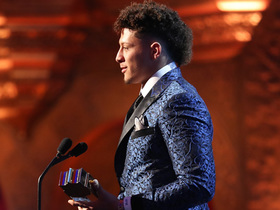 Kansas City Chiefs quarterback Patrick Mahomes accept the award for 2018 Offensive Player of the Year. 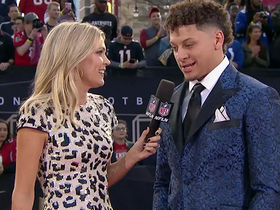 NFL Network's Melissa Stark catches up with Kansas City Chiefs quarterback Patrick Mahomes ahead of NFL Honors to talk about his spectacular 2018 season, winning a playoff game in Arrowhead Stadium, what the future holds and more.